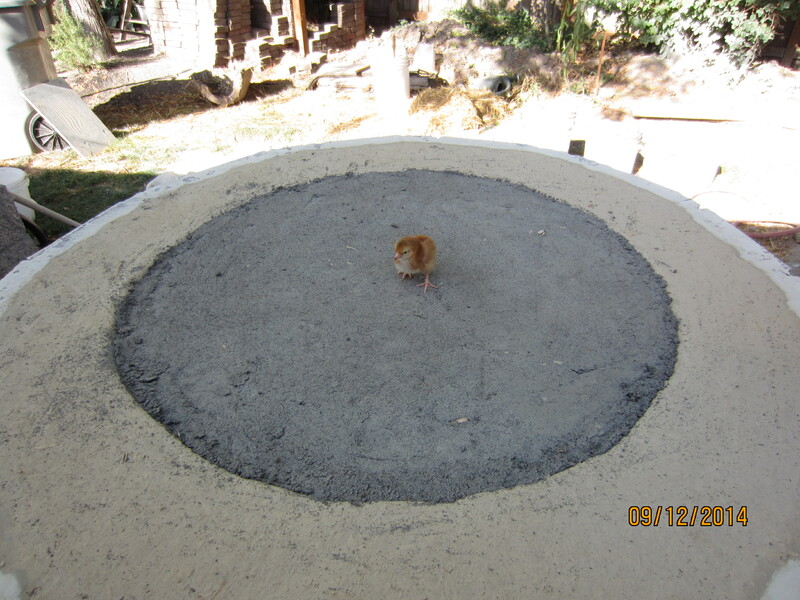 Here I am building a ring of re-purposed paver stones on top of the concrete foundation I poured. 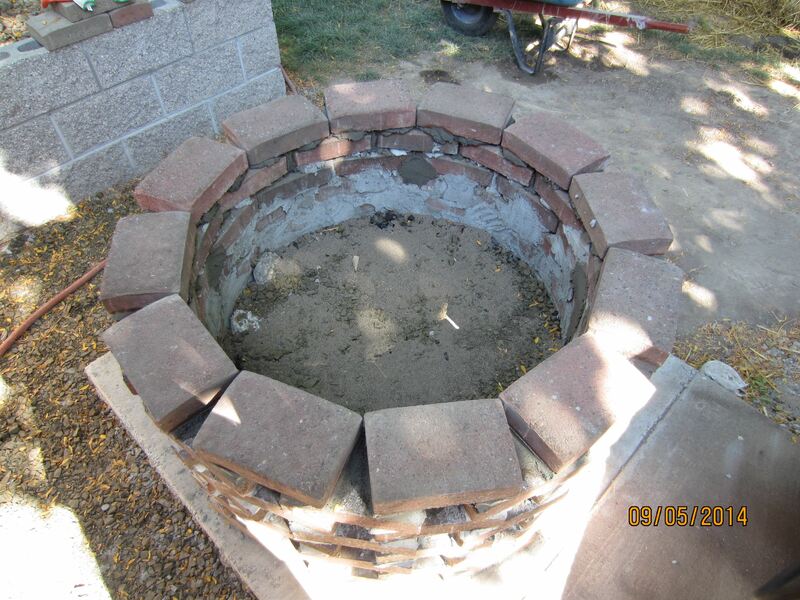 The ring will hold a bunch of rubble (old bits of concrete from pulling old fence posts, broken cinder blocks, rocks etc) that will make a solid base for the oven. 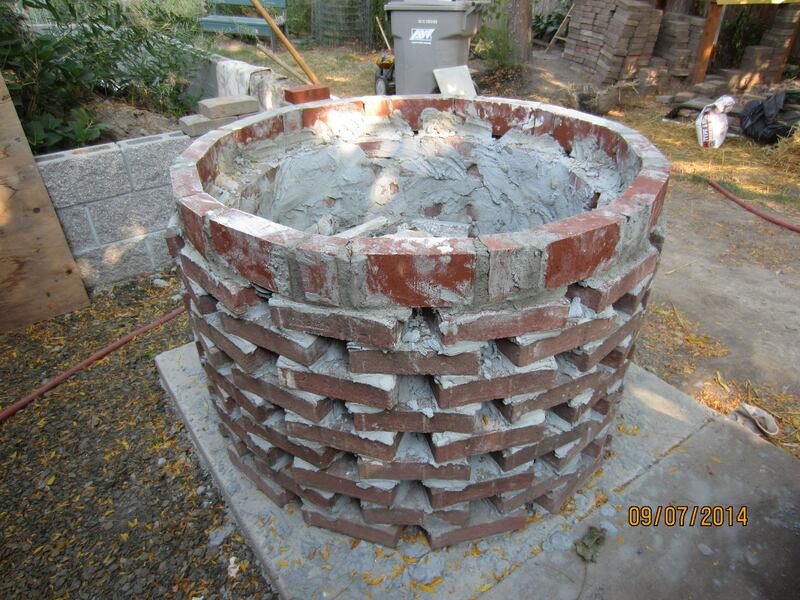 I’ve got 8 courses of bricks at this point, which is as high as i’m going with the pavers (about 26″ high). 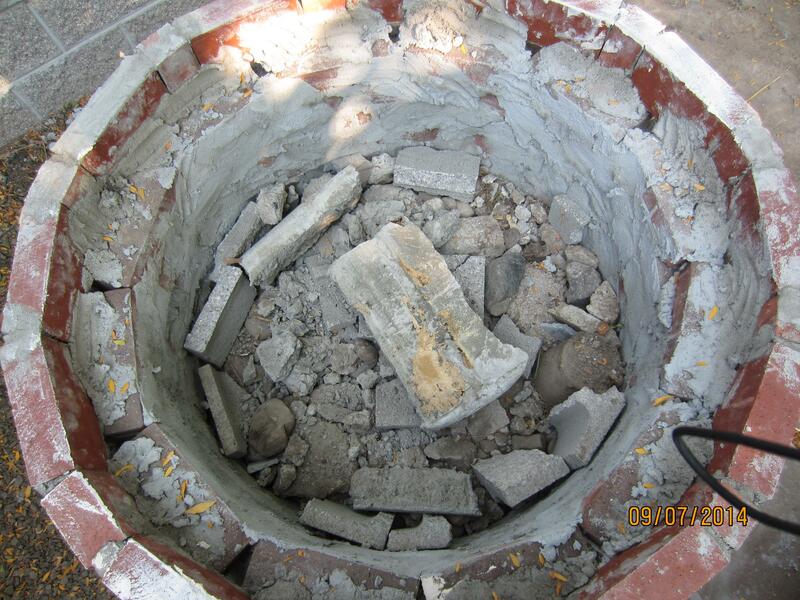 I’ve also been filling in more rubble for the base and tamping it down. 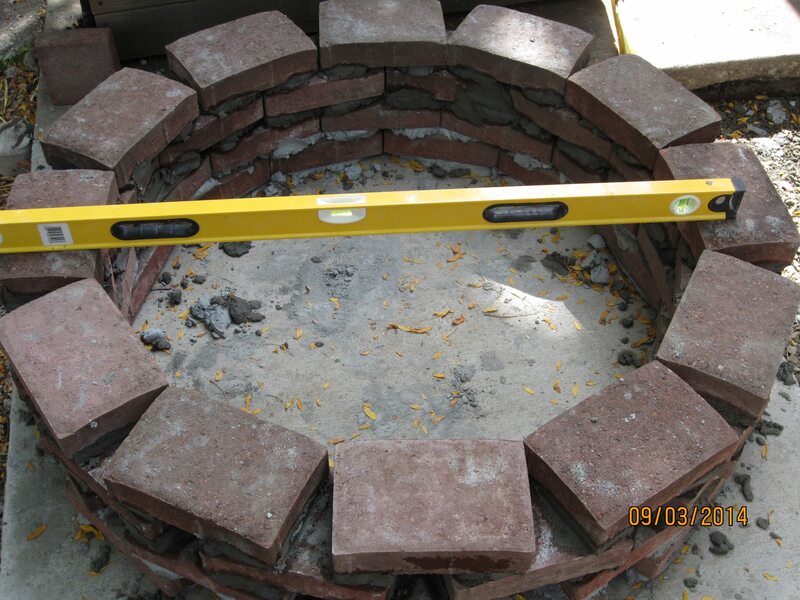 I added on last ring of bricks to raise the height of the oven base a little. 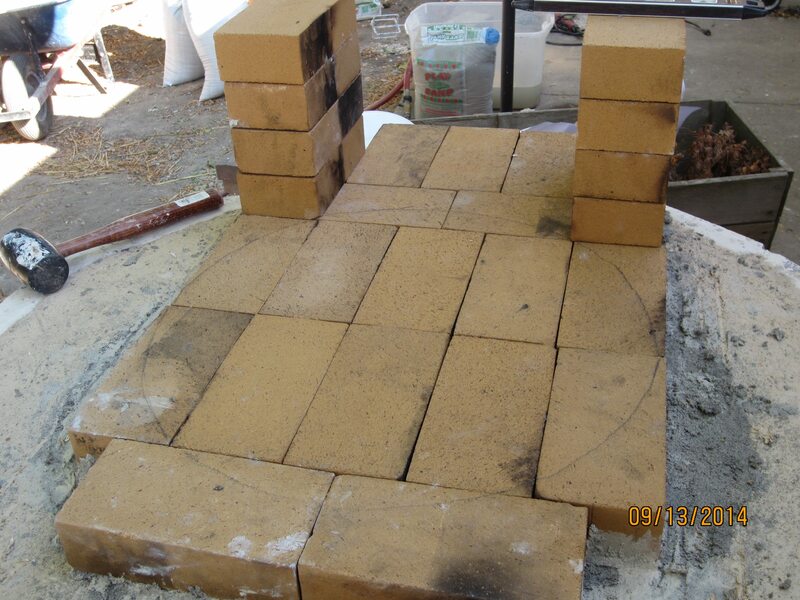 In this case I used standard red clay bricks and set them on edge. 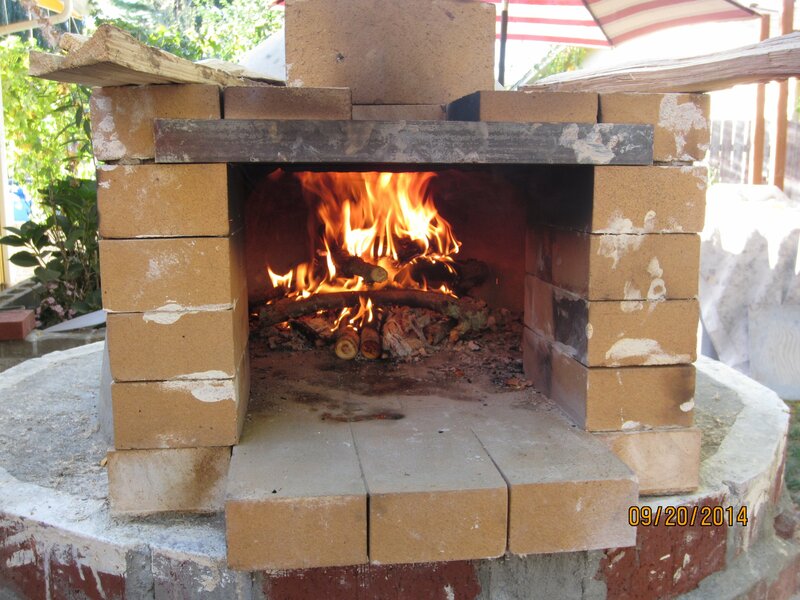 This will let me have a little more insulation between the oven and the base. 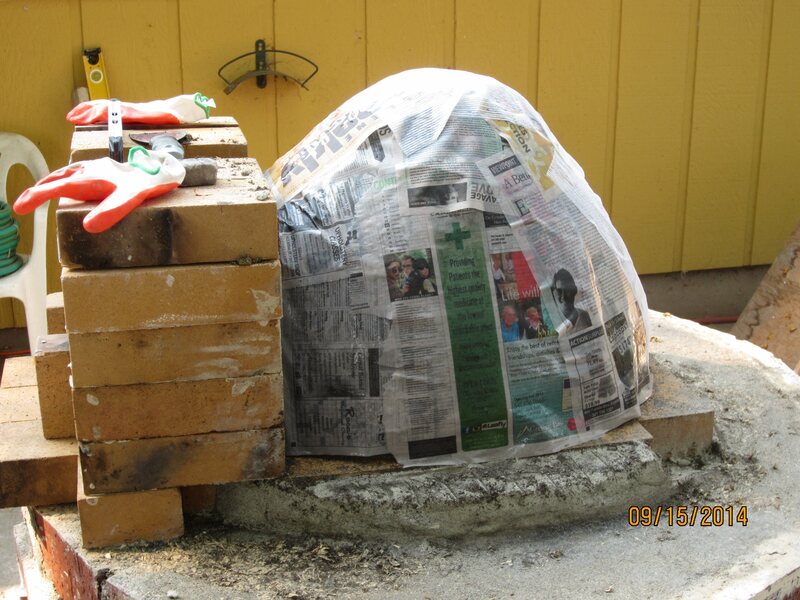 Adding more rubble, odds and ends from the brick wall project and a bag of concrete mix that got wet last year. 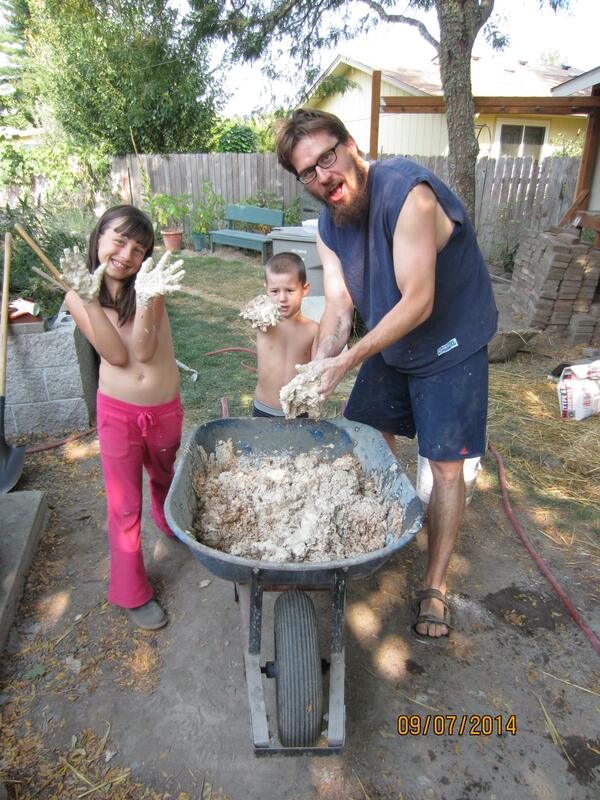 The kids and I mixing up our first batch of ‘insulation’ for the oven. 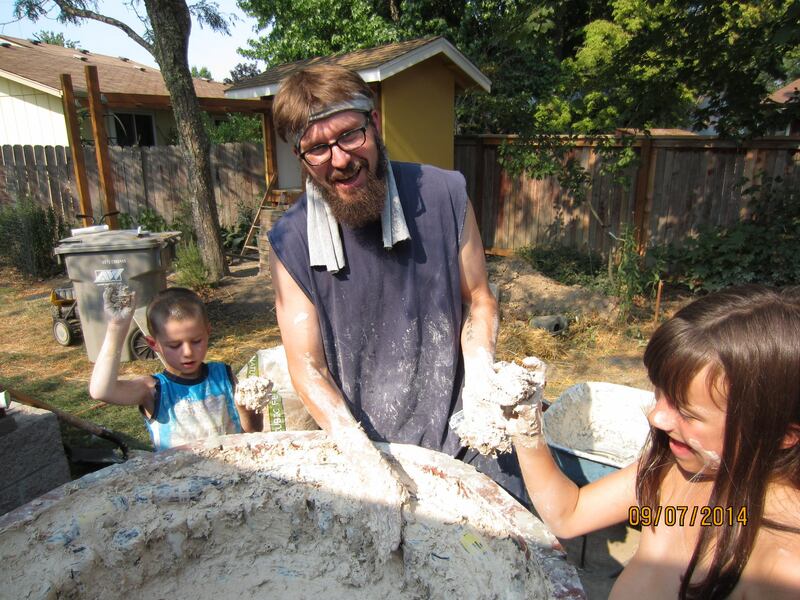 We are using a thick clay slip made from fire clay and mixing in pine shavings (livestock bedding). 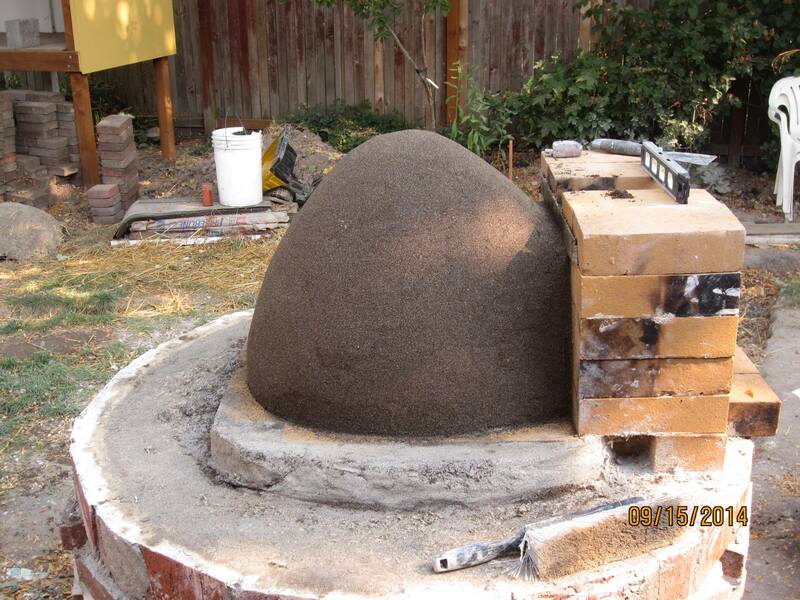 The idea is when it dries and then gets really hot the wood will undergo pyrolysis (decompose to gaseous products without actual combustion) and leave a sort of clay sponge that should make a good insulator. Here we are putting in the base insulation. 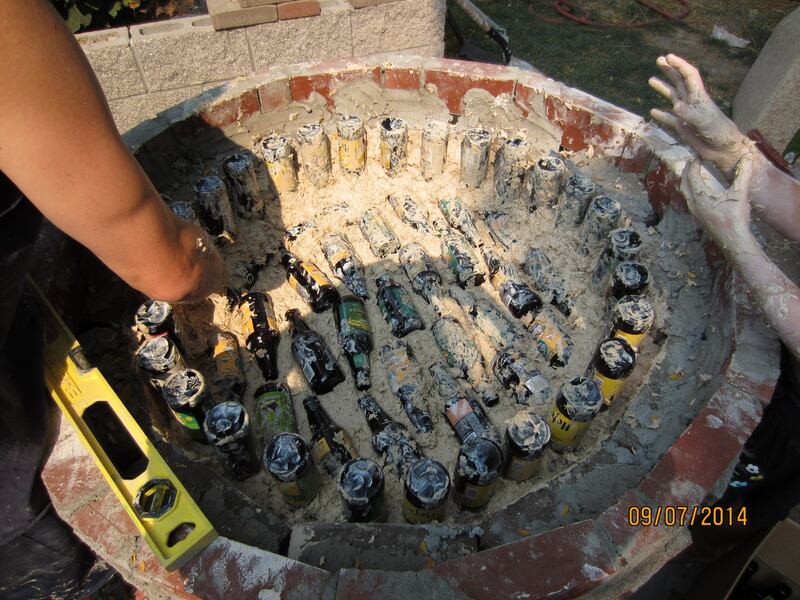 Beer bottles separated by small gaps filled with the wood shaving/clay slip mix. 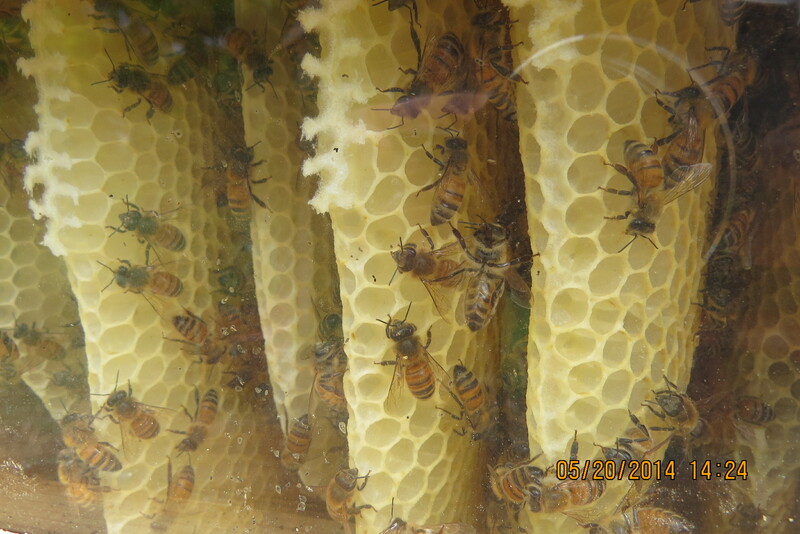 The idea is to provide a solid base with good insulative properties. Packing ‘insulation between the beer bottles. May have had a few beers (you know, for the good of the oven) at this point judging by my expression and the headband…. 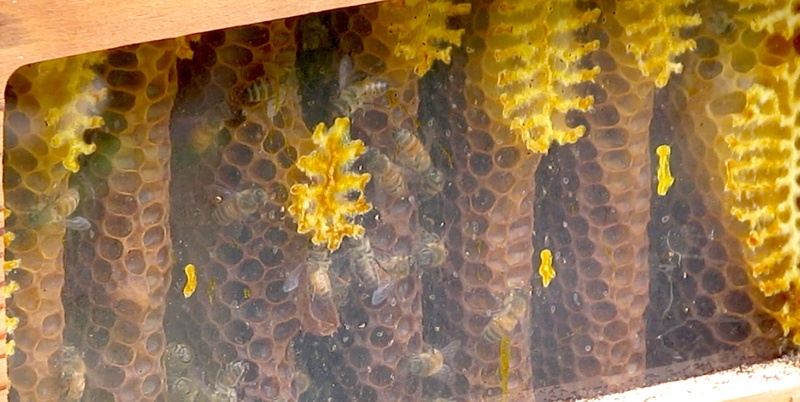 A second layer of bottles goes in the floor, and if you look you can see a ring of horizontal bottles between the vertical course of bottles and the outer brick. 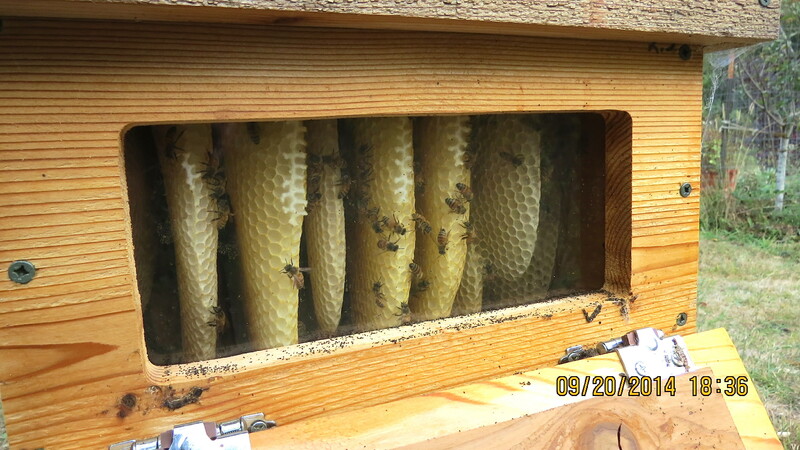 The base insulation layer is done. 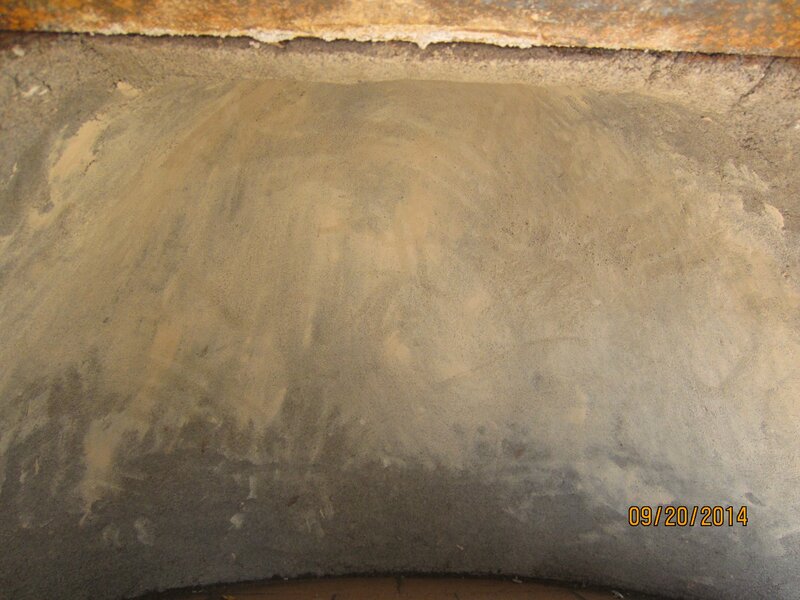 There is now about six inches of insulation between the outer ring and base, and where the thermal mass of the hearth will be. 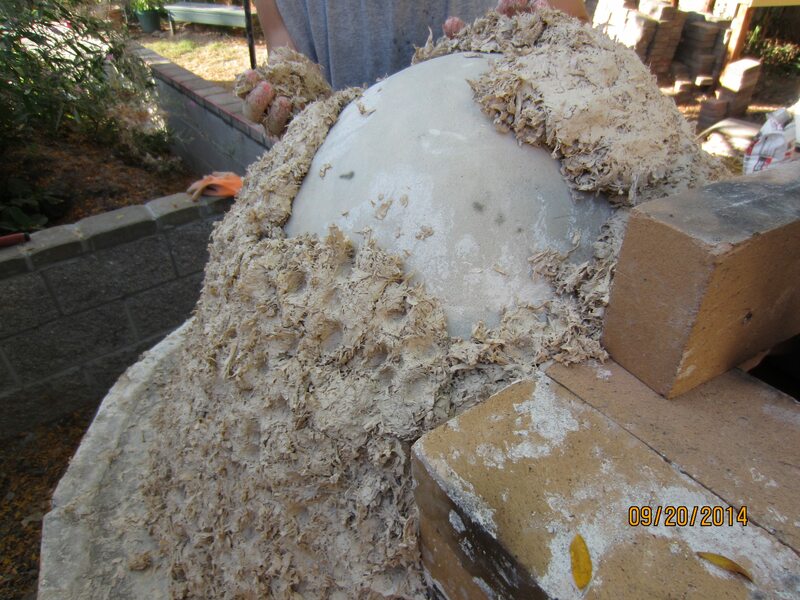 This is first layer (about 1 1/2″ thick) of thermal mud being put inside the insulation layer. 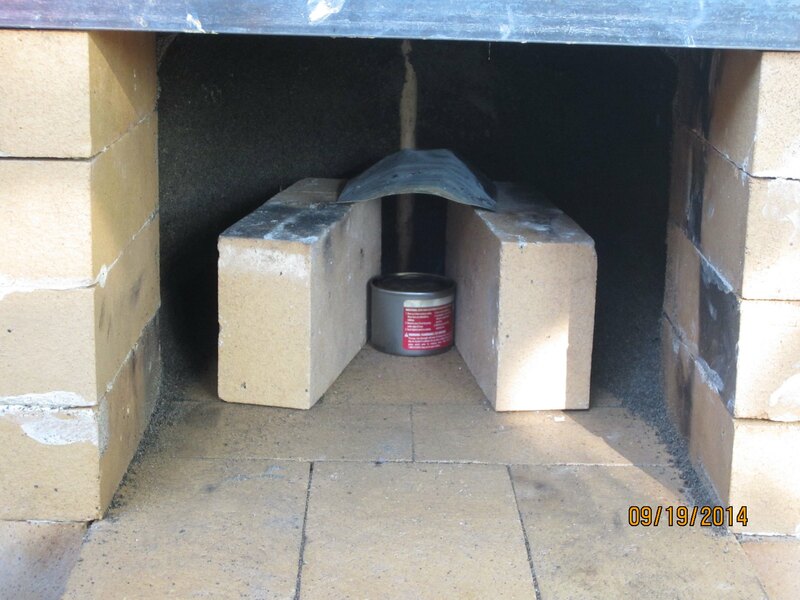 The thermal mud will be directly under the fire bricks we are using as a hearth. 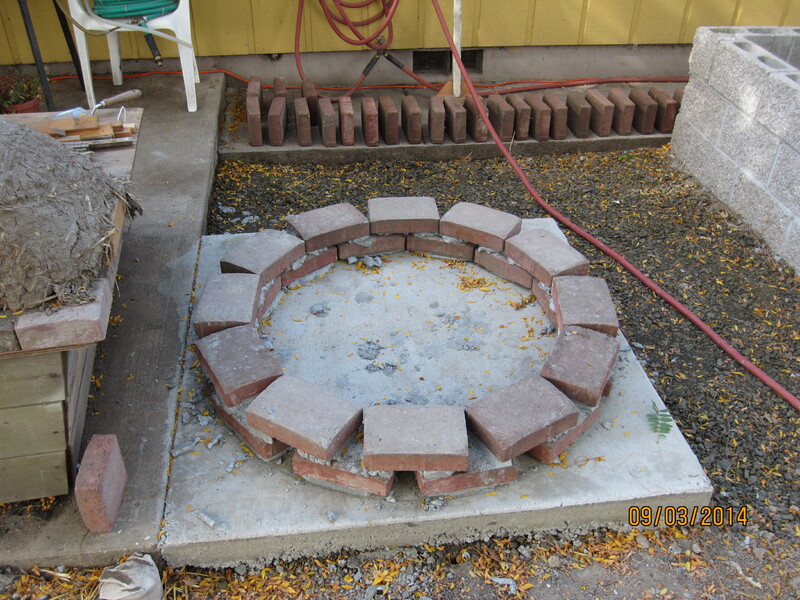 Now that we have the insulation and thermal reservoir in the base it is time to lay out the hearth. The kids consider geometry…. 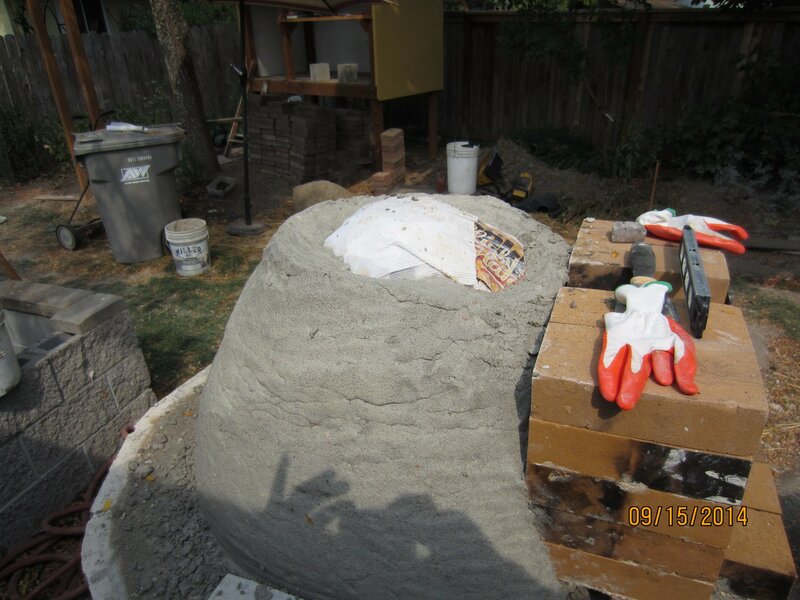 A rough first pass at the hearth layout shown from the back side of the oven. Note the circle drawn on the bricks. 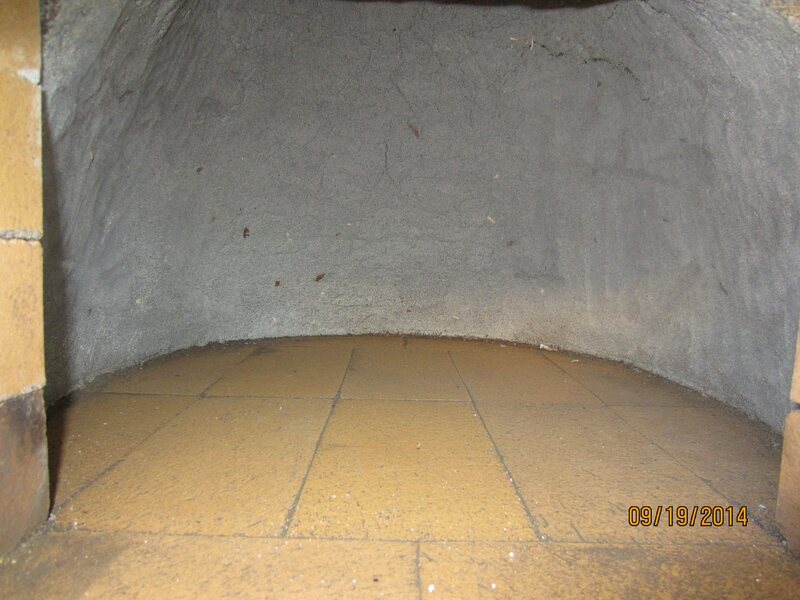 That represents the internal void of the oven. 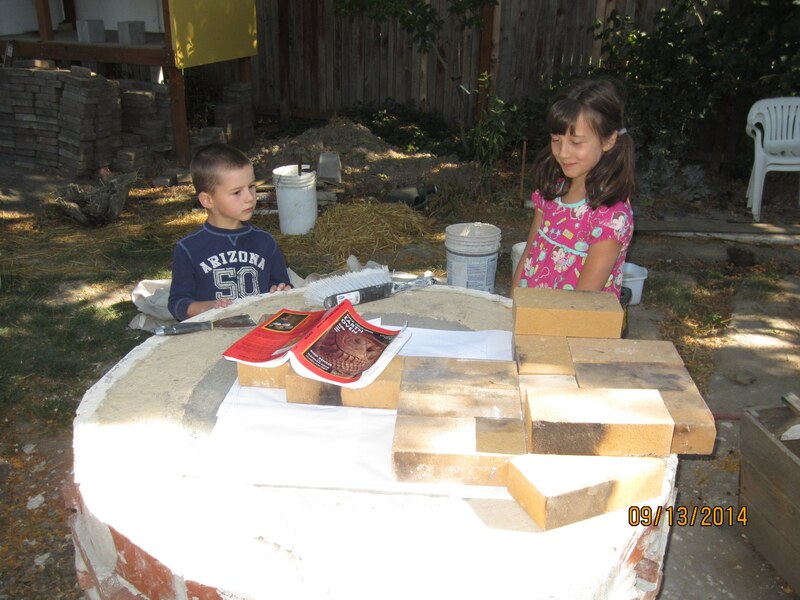 Here we are making a sand castle that will become the void space of our oven. 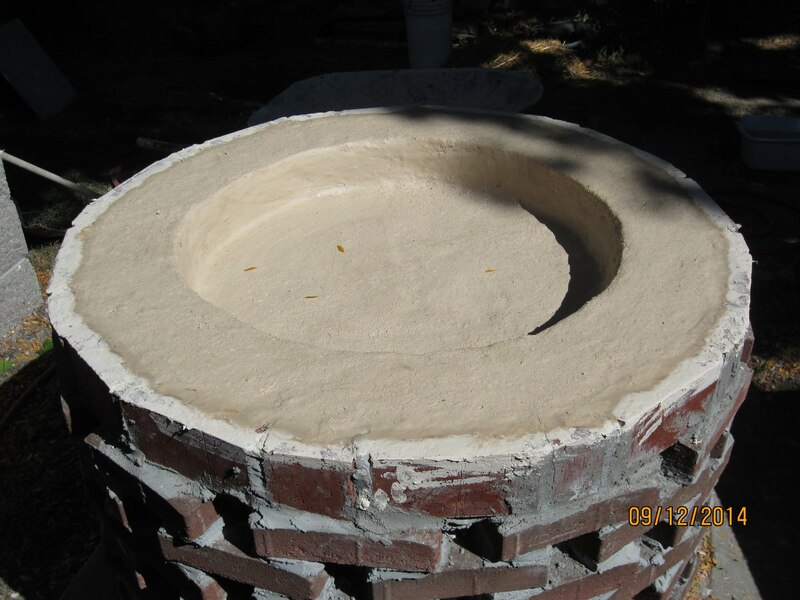 Instead of going with the round oven hearth suggested in the book I extended it a wee bit into an elliptical base for a bit more cooking area. 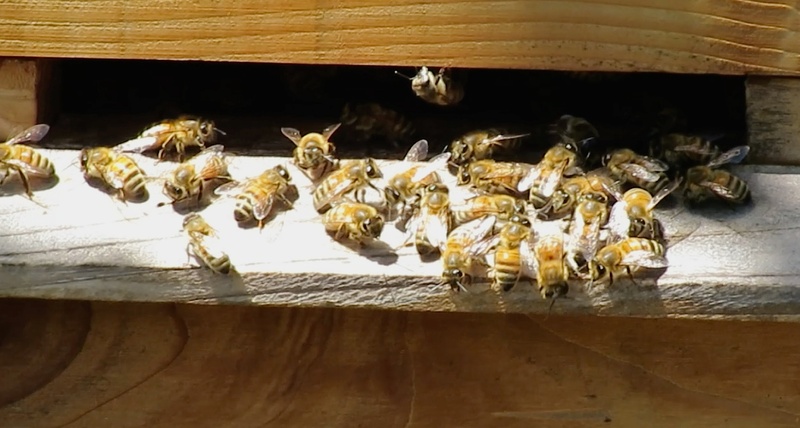 the damp sand was densely packed by whacking it with a 2×4. 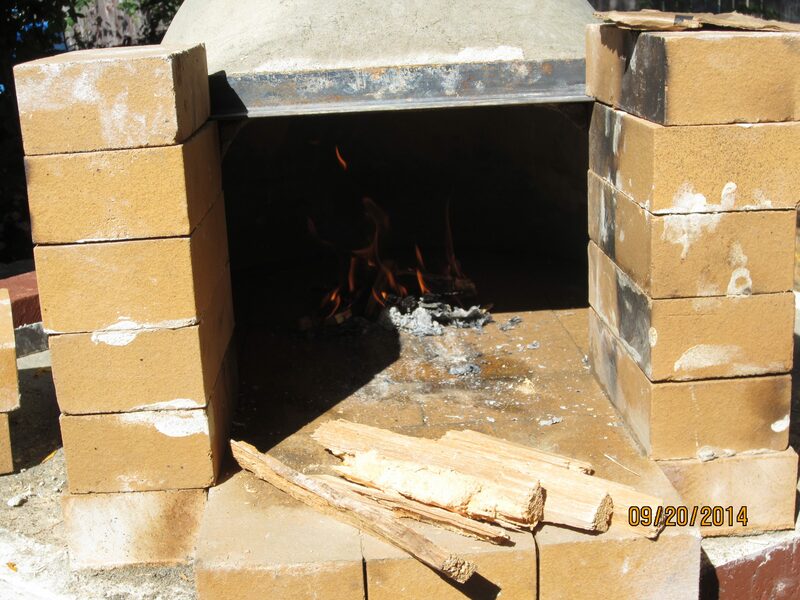 We cover the sand form with wet newspaper so that we can see the transition between sand and clay when digging out the oven. Continuing to add to the dome. 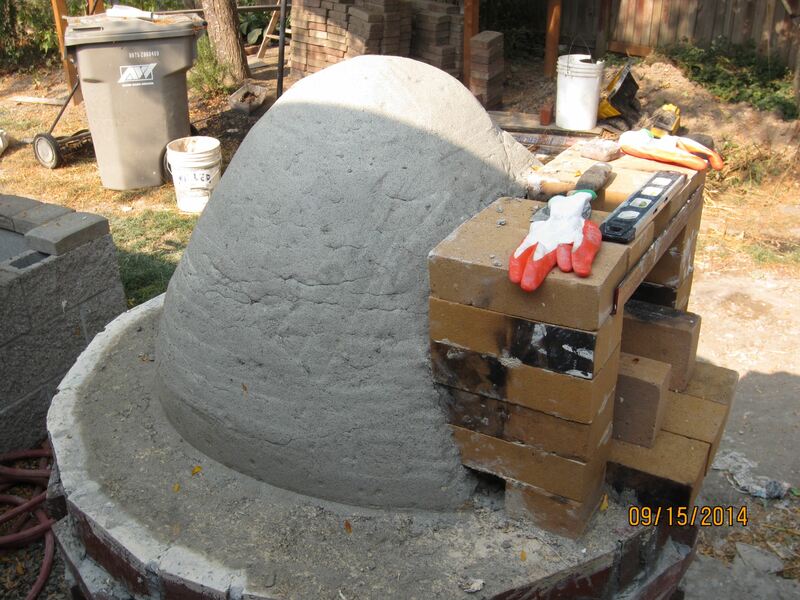 At this point there is about 350 lbs of clay and sand in the thermal layer. The dome is finished (actually this is the second time we built the dome. The first time the kids were really trying to help and we were running out of daylight, so let us just say that quality control was lacking that day). 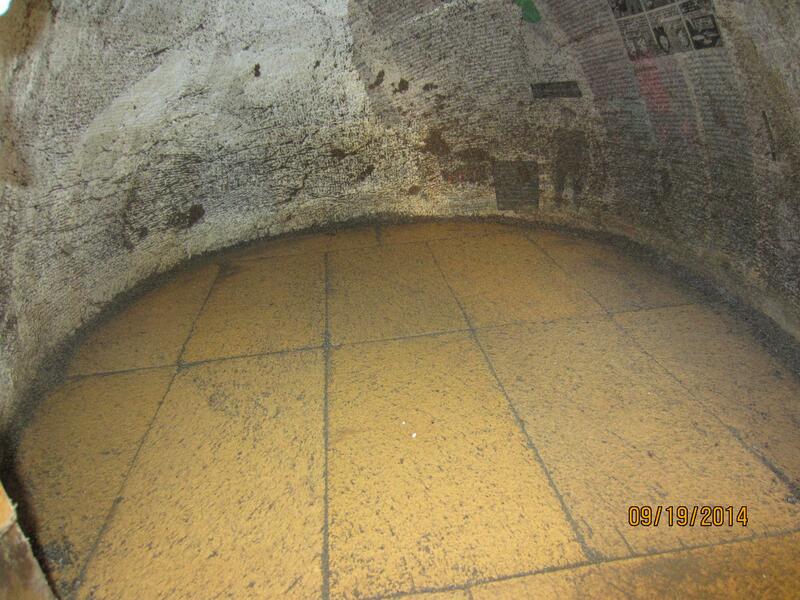 I am impatient, so I start scraping sand out of the dome after only 2 days. 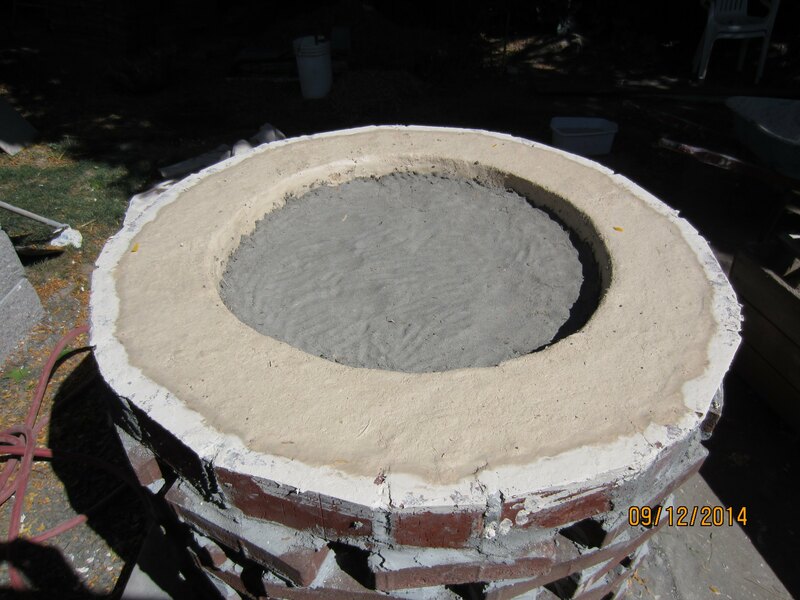 My plan is to speed the drying by using some Sterno inside the dome while leaving some of the sand for support. It seemed to work. 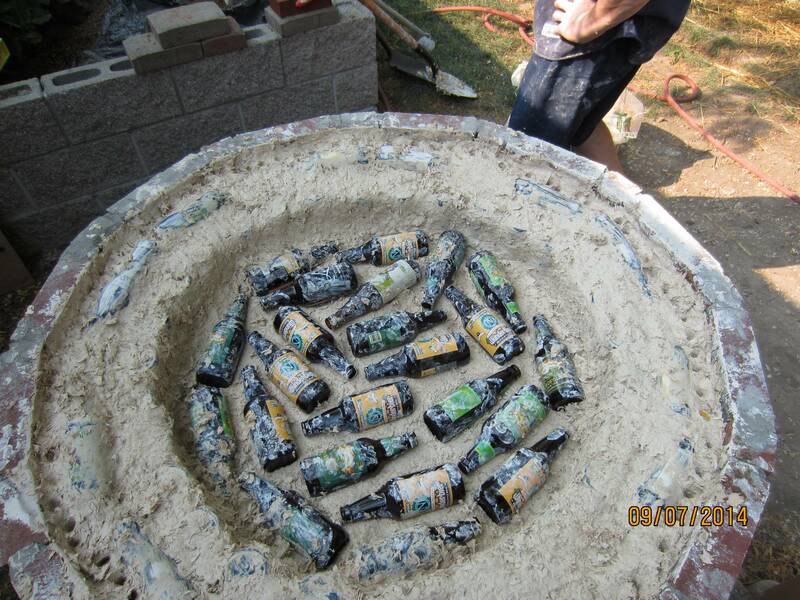 The dome did not collapse and after 3 cans of Sterno I got most of the sand out. 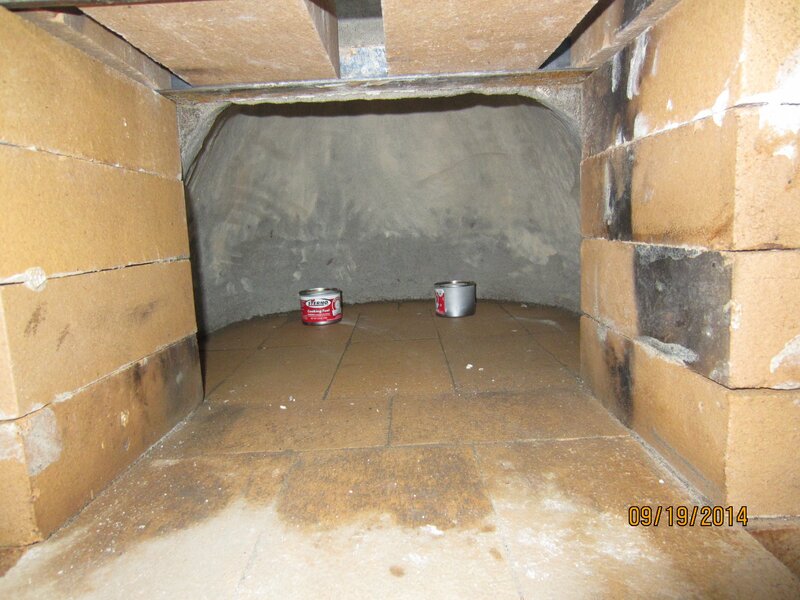 The sand and newspaper has been removed from the oven cavity. 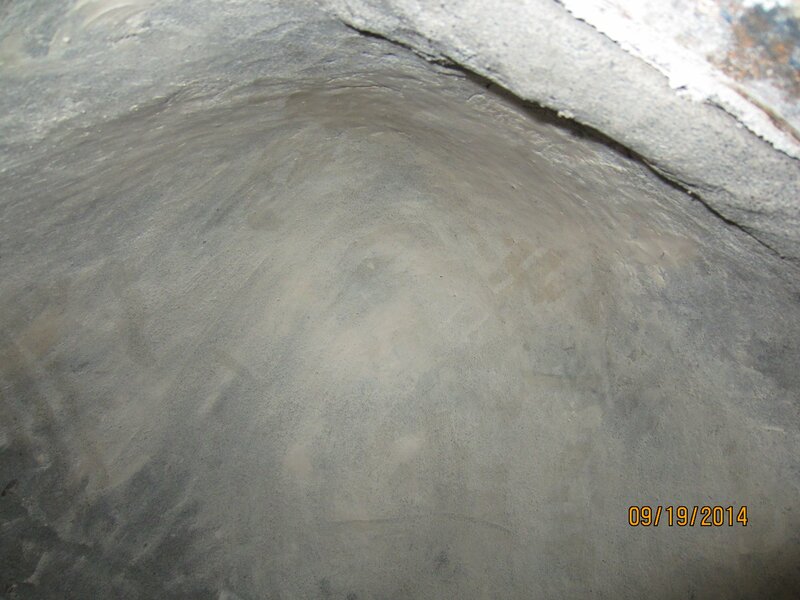 The inside of the dome isn’t dry yet, so I was a little concerned it might slump. 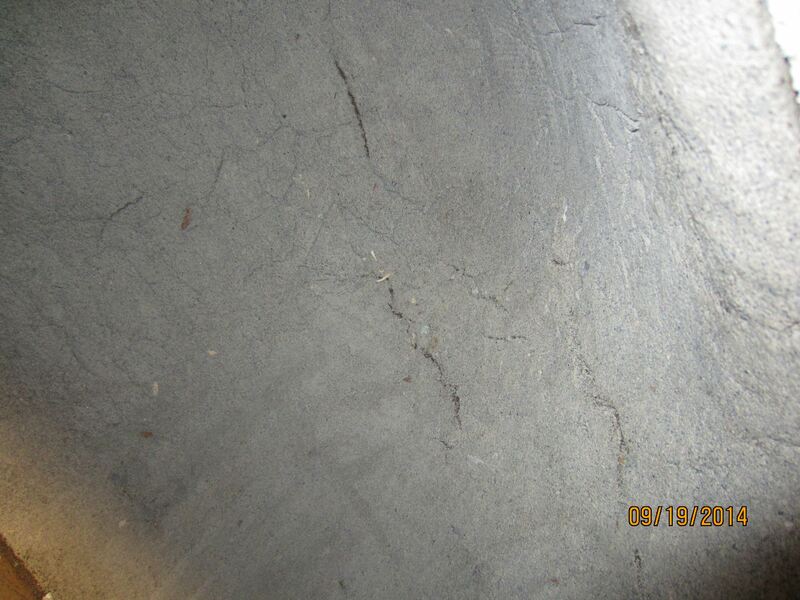 As the inside dries (the outside was significantly drier by now) some cracks form. I don’t want sand and clay to spall off of the dome into our food, so I set about filling in the cracks with some wet thermal mix and massaging it in with the back of a serving spoon. First pass with the spoon is done, and the dome is looking pretty smooth, though still pretty wet. In an effort to speed things up on the inside I fire up two cans of sterno. After a little more drying and cracking (and 2 more rounds of patching/smoothing) the dome is looking good and feeling dry. Now we attempt to really get things moving with a small ‘drying fire’ just inside the dome. 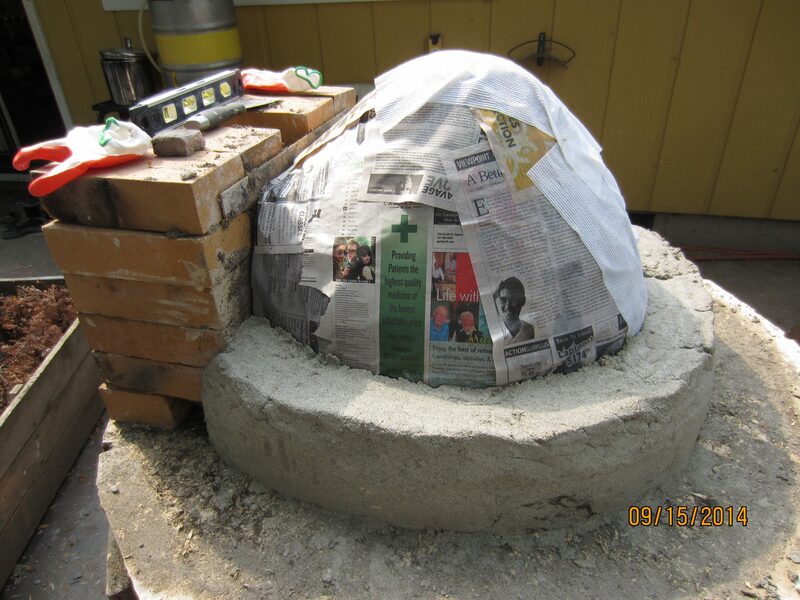 As the fire is burning, drying out the dome, we add the first layer of insulation mix. More of the clay slip and wood shavings. Since the dome is dry it probably won’t stick well, but this is OK since the layers will be acting independently, both structurally and functionally. 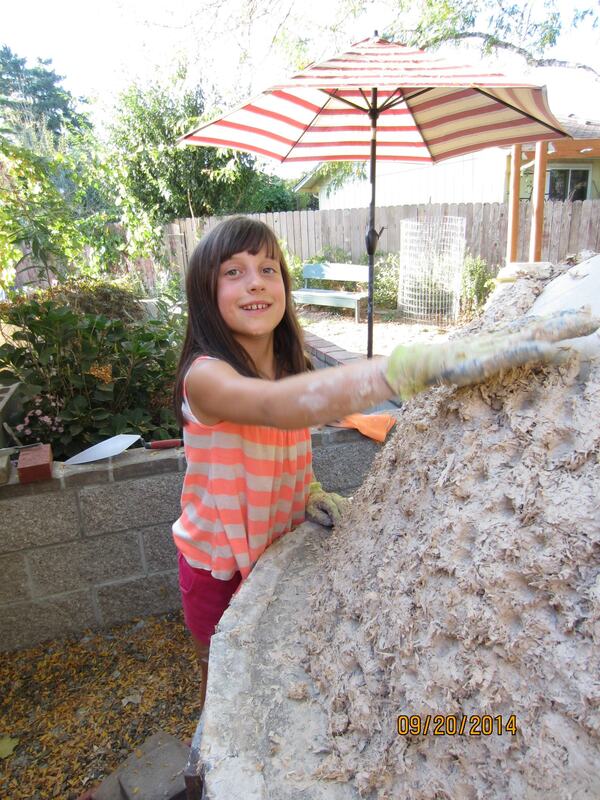 Chloe puts the finishing touches on the first insulation layer. 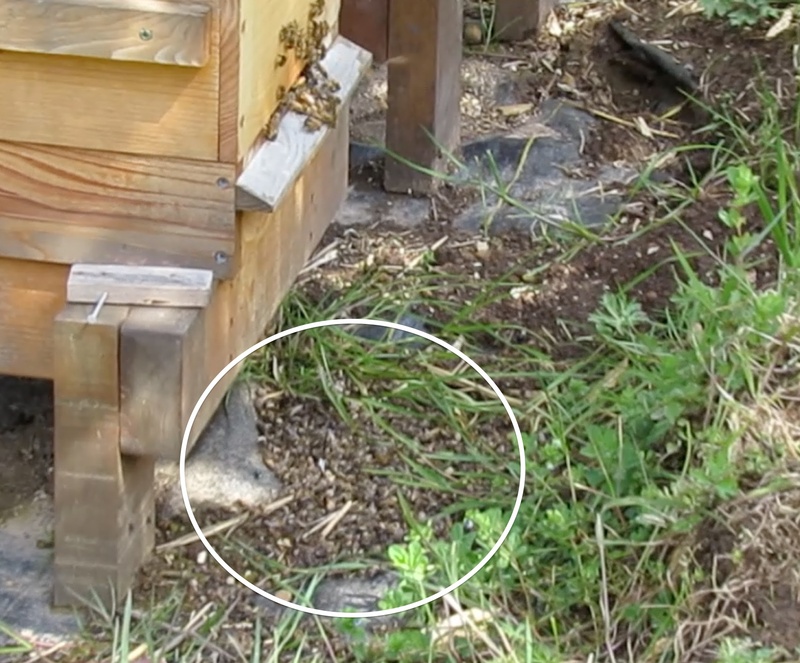 Notice the divots in the insulation. This is so that the next layer will bond to it. 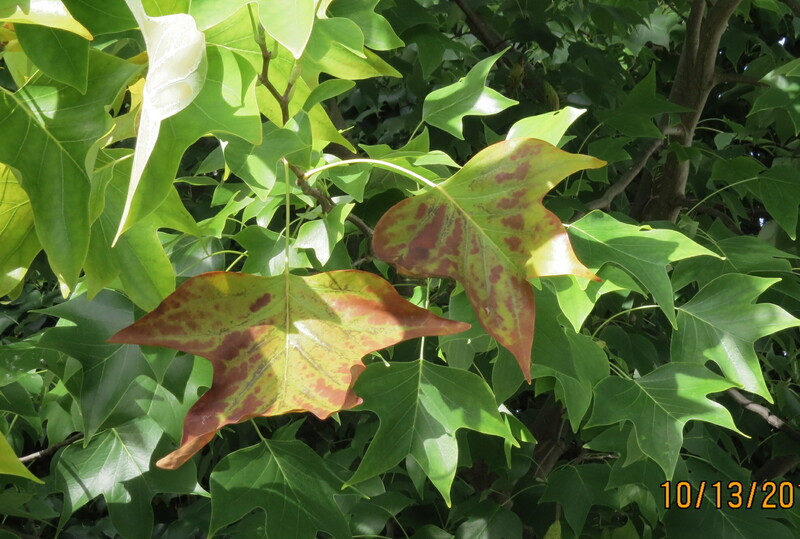 October 13…Tulip tree is still holding on, but more colored leaves can be seen. The sun is lower on the horizon as can be seen by the shadow on the left side. The blue sky is disappearing tomorrow for a while. 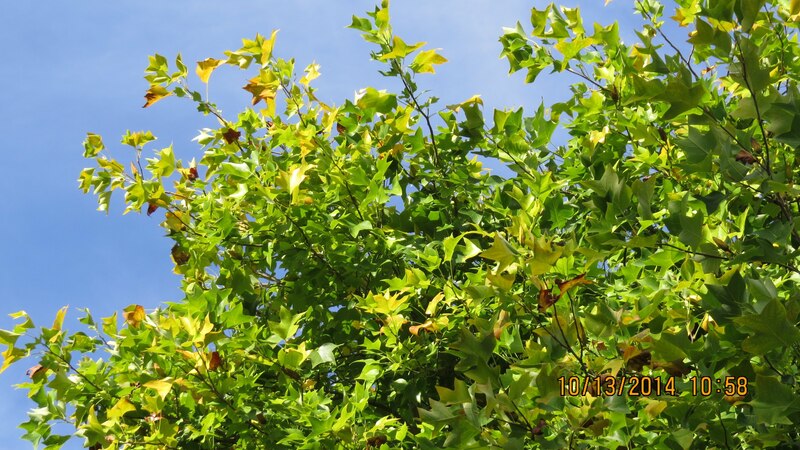 It’s been so good to get sunshine this late in the season, but that’s coming to an end soon. 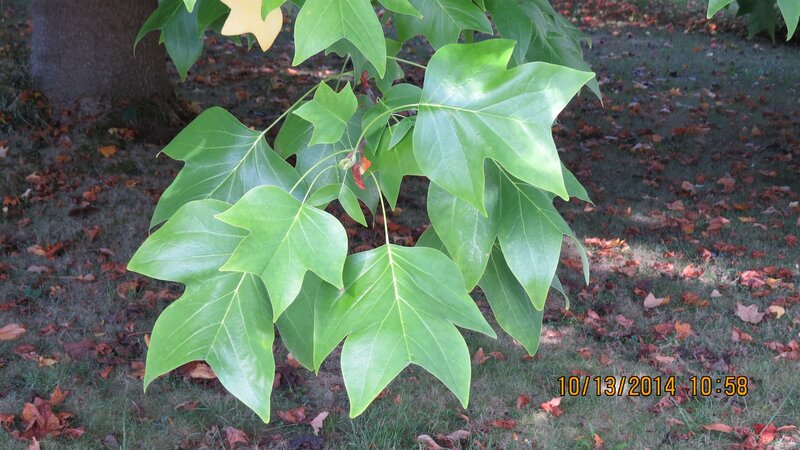 These leaves are starting to lose their chlorophyll enabling the other colors to be visible. A few leaves have dropped. 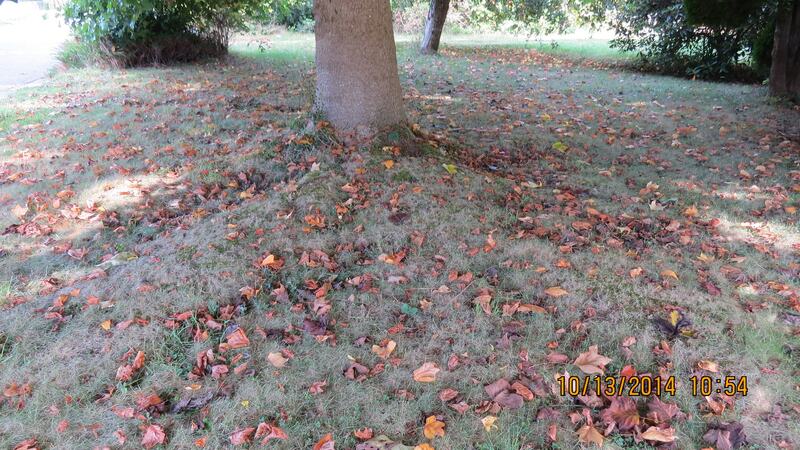 Not enough to rake up yet, but it won’t be too long. 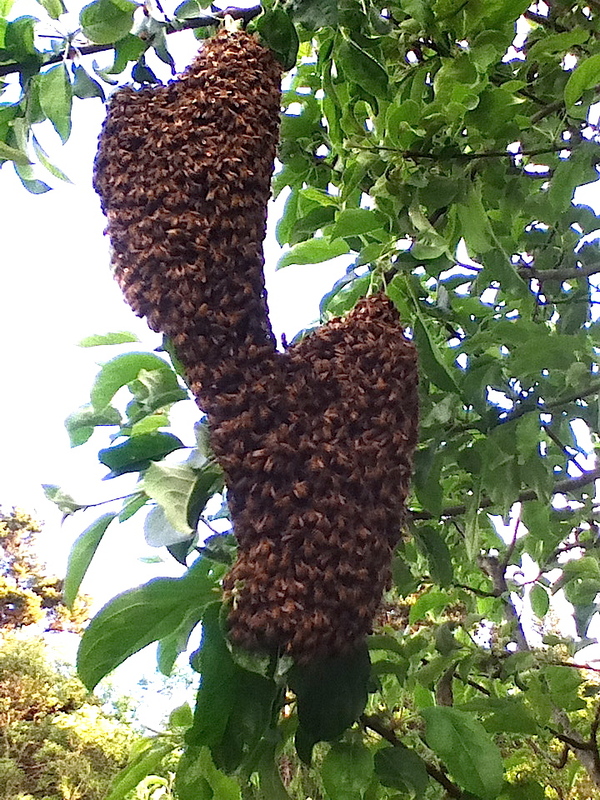 I’m actually looking forward to getting this valuable treasure for my garden. 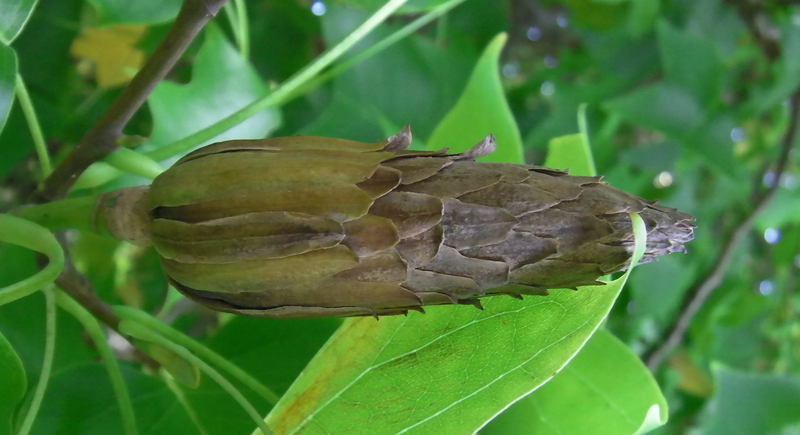 I’ve been ‘following’ this seed pod trying to be there when it opens. I’m beginning to doubt that it will open. But if it does, I’d like to plant the seeds just for fun. 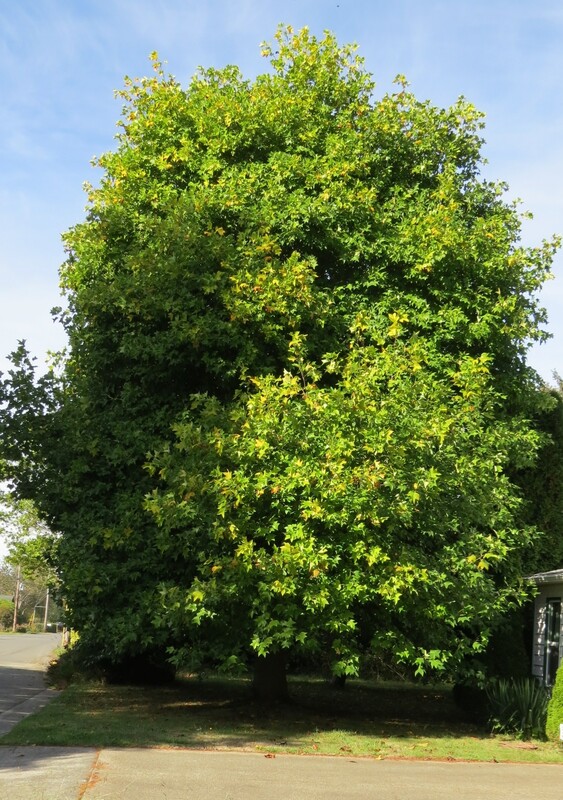 New leaves are still forming, so this tree is not ready to call it quits just yet. 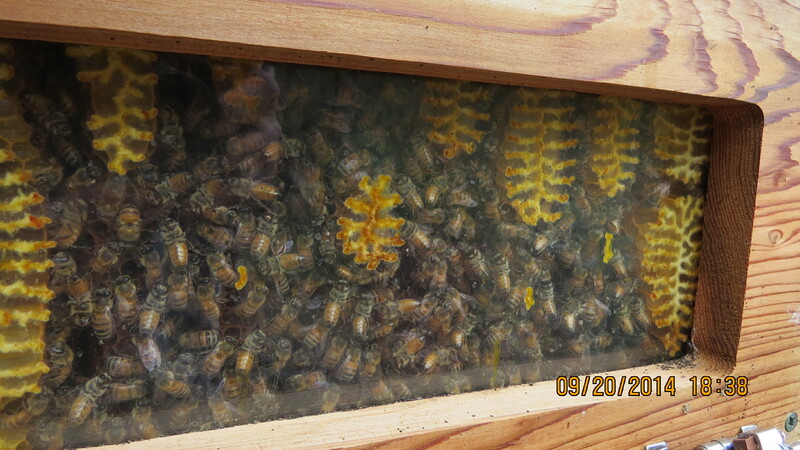 This hive started out as an emergency backup hive on April 18, 2013. 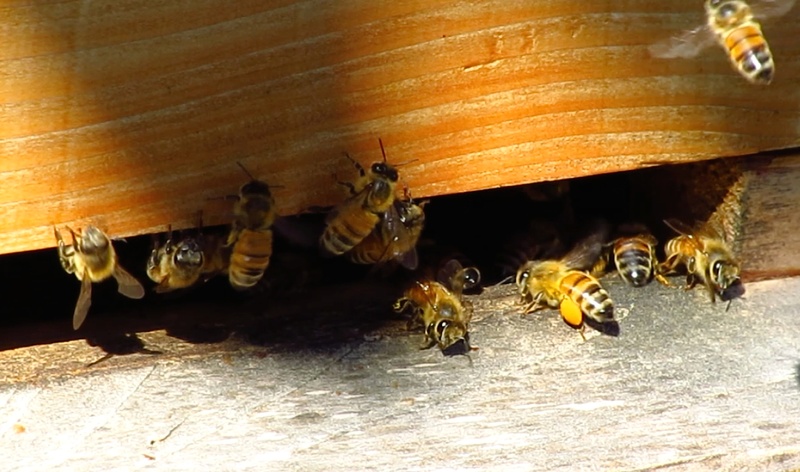 It was the fourth or fifth swarm to come out of my log hive. 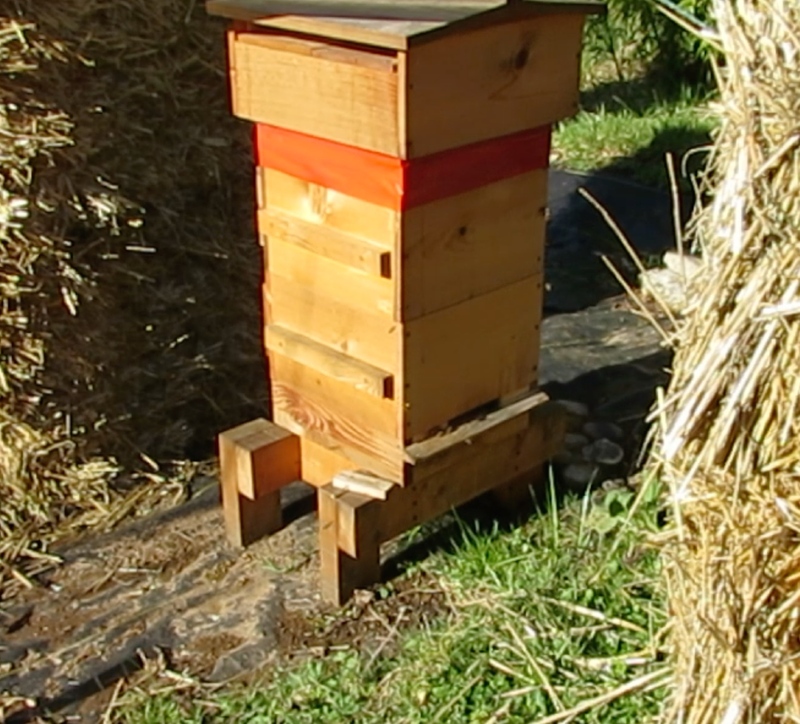 I fitted it with bars that would fit my Warre hive just in case. 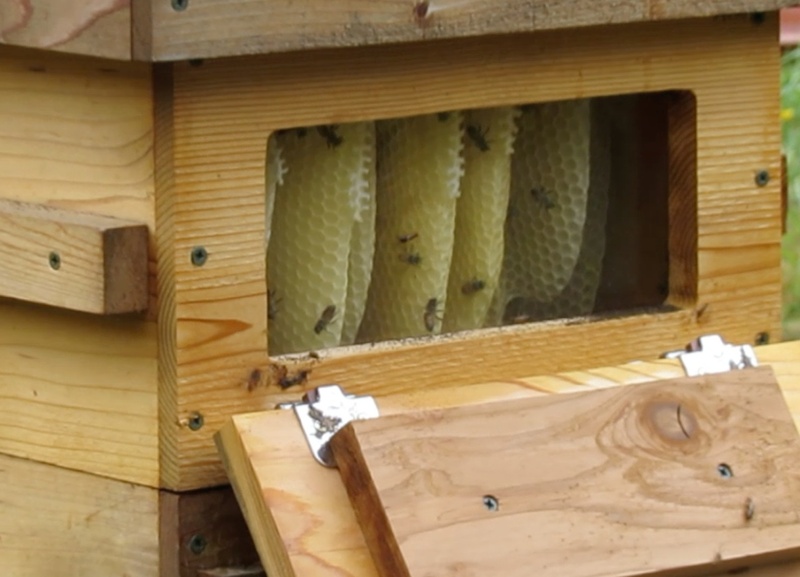 I added a quilt box on top complete with screened air holes and myrtlewood sawdust from my Bee-atrice log hive which was under construction at the time. 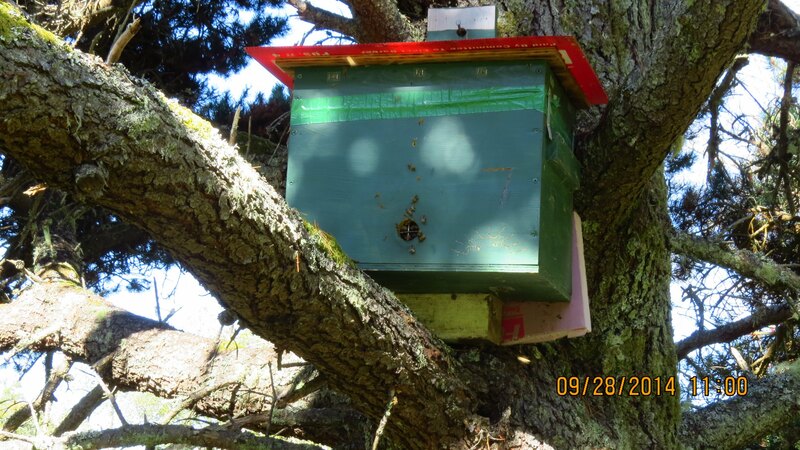 When I realized I wouldn’t need that backup hive, my wife and I decided to leave it in the tree during winter as a sort of trial to see if bees could come through our mild winter without any intervention. I’m happy to say it came through the many wind and rain storms without me treating or feeding it. 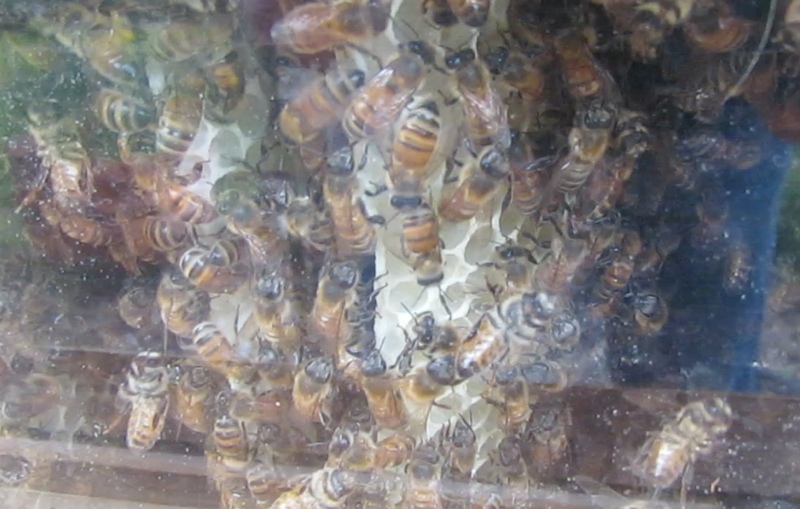 It threw three swarms (two at once) that we know about and is still going strong as you can see by the video.